Bot is the service which interacts with users. Bots are like virtual assistant which can converse, address queries and help users to get the things done faster seamlessly without manual intervention. We can easily develop the ChatBot Application by using the Microsoft Azure Bot Service, Cognitive Services. 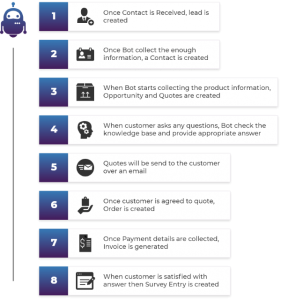 ChatBot can take care of routine tasks, sales responses etc. Attending the lead and resolve rudimentary as well as complex queries with prompt response, which inturn helps prospects to get necessary information and further gravitates towards prospects of conversion. It can be little tedious to manage the data into system using CRM. To log the data into the system, switching multiple tabs / CRM Screens. It takes efforts and time. Also at times it might be complex workflows/process to input and save the data. Chatbot integration feature actually can be pre-programmed to handle information and seamlessly update the same in the CRM. ChatBot can also integrate with messenger, email, social media, ERP to retrieve data from different sources. The data can be anything like purchase history, transaction history, Product information, User Activities etc.